Dates are great way to break the fast and just as important before you start. 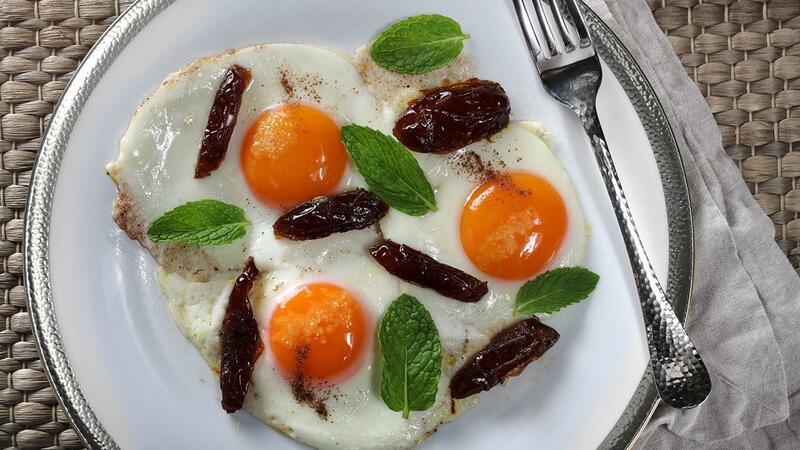 In this Sahoor recipe we use the high protein and savory flavor of egg to compliment the sweetness of dates to get your guests ready for the fast. Heat a small nonstick pan on low and melt the butter. Add the dates and cook slowly till soft and almost falling apart then add the cinnamon, remove half and set aside. Add the saffron strand and toast for a few seconds then add eggs, 3 per portion and fry with the dates on low heat till cooked. Place the toast on the plate then slide the eggs on top. Garnish with the reserved dates and mint then season with the Knorr Chicken Stock Powder.